Middle-earth RPG session 2 - curse you, dice! The second session of my Middle-earth RPG went really well and I'm incredibly happy with the way it's going. Cthulhu: Dark Ages is a perfect fit for this game and now that I've got my hands on the Decipher 'Lord of the Rings Roleplaying Game' core rulebook I'm going to mine it for ideas, and try to get some of the Renown and Courage rules inserted into the game. I thought an exciting encounter would be running into a forest troll in a run-down watchtower on the edge of Mirkwood. There could be a great fight, or maybe the players would try to sneak past, or maybe con him, or ambush him... but no. Big J steps up to him and takes a swing. One swing and one critical hit with maximum damage doubled later, there's a dead troll on the ground. Gone was the encounter. So, I figured I'd throw a pack of wolves in to make up the time, and try and force the PCs into the watchtower where the next part of the adventure was going to take place. But Big J, still flushed with his victory, stands his ground... and during the fighting gets three more critical rolls and takes them out with single hits. As a prize for his prowess I awarded him a Westerness blade (+1 damage) from the troll hoard, but I was reminded of something very important I should have remembered as a GM: no matter what plans you make, no matter how you'd like the story to go, it's never possible to predict the actions of players. It's even more impossible to predict the outcome of sodding dice rolls! Just to be clear, I've not introduced the Cthulhu mythos to Middle-earth. What I've done is something I planned to do for a long time and that's use the Cthulhu: Dark Ages BRP system to run a campaign in Tolkien's world. Why not just use BRP or Runequest? Well, the system as it is didn't really appeal to me due to the options and some rules that I thought complicated the game because after a couple of years playing 'simpler' systems such as Basic D&D, Dragon Warriors and Star Wars D6, I didn't want to get bogged down. We did flirt with D&D and even Pathfinder, but it was agreed that BRP was the best fit for what we wanted to do. To get away from the more complicated options of BRP and to save me the work of trimming down Runequest to suit my needs, Cthulhu: Dark Ages rose to the challenge. As a trimmed-down version of Runequest/Cthulhu it's pretty much what I want in a fantasy RPG. Runequest Monsters and some of the mythos creatures fit well, and thanks to some Middle-earth downloads from the BRP message board I was able to fill in a lot of blanks. 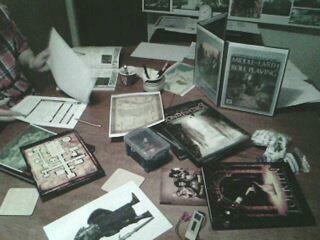 In fact, that download page and the Cthulhu: Dark Ages core rulebook was all I required to run the game. The first session went well. It's being played as a sandbox setting so that the players, both of whom know the setting well, can explore to their heart's content. It's set two years after the War of the Ring so the world is still a little shaky and the armies of Sauron are fled or hiding. There are plenty of places that are now abandoned, such as elven settlements and old forts and towers, so there's some great potential for adventures. For the game I also used: The character counters from the Pathfinder Beginner's Box for minis, Mongoose's 'Legend' core rulebook for some of the options,The Illustrated Guide to Tolkien's Middle-earth for quick reference, the appendices of The Lord of the Rings for post-war information and state of play, the three 'Art Of' books from the Peter Jackson movies for visuals, and lots of art from the 1980s MERP game for the same. Big J, one of my players, was kind enough to print out plenty of sheets and old MERP module covers and set up a large reference board to help with the atmosphere. The adventure began at the small settlement of Hedgehome by the westernmost entrance to the road through Mirkwood. Who is the Traitor General, and why has the village of Fortuin been abandoned? A great system for a great setting. I'm looking forward to seeing how this plays out. Now it's time for session 3 of the Google+ Basic D&D game, bought to you by the fine pen of Nancy Petru. Of course, when I say 'pen' I mean 'keyboard'. That is, unless, she wrote it all by hand first and then typed it out. I have no idea. He takes a huge leap and lands right in front of us, blocking the cave mouth. Liramorel tries to speak to him, but fails the charisma roll. Ridley succeeds in hers, and asks him if there’s anything we can pay him to allow us passage into the cave. The warrior’s eyes never waver. He brandishes the sword and says, “Pay the toll with your souls.” Another sword appears in his other hand--a black hilt with a black blade that looks like oily smoke. The wight rushes past Ridley, making for Liramorel. Ridley whacks him with her dagger as he bowls her over. A deep chill settles into her bones from where he touched her. Alistina casts magic missiles on the hand holding the black blade, while Ballamin scores a lucky critical hit on the hand holding the jeweled sword. Nessa swiftly follows up Ballamin’s attack and slices the arm clean off, both the arm and the sword tumbling through the air. Rowan passes a quick dexterity roll and neatly catches the sword. Evadne and Velira both attack the wight, but fail to land a hit. Kezia casts a spell to heal the chill on Ridley and put her back on her feet. The wight focuses on Rowan and attacks with the black blade. She fails the armor check, and the blade slides through her shoulder, not leaving a physical wound, but freezing flesh and bone and immobilizing the arm completely. Alistina and Ballamin leap forward to cover Rowan and attack the wight in tandem, and succeed in hacking off his other arm. When the black weapon hits the floor of the cave, it is just a black hilt--the blade has disappeared. Liramorel dodges the fire and ash spewing from the enraged wight’s mouth and attacks, while Ridley slams her blade through the back of his head, the point emerging between his eyes. Nessa focuses and cast her magic missiles. His head explodes! The remains fall to the cave floor, still twitching. The arms we had hacked off in the fight are slowly inching across the floor towards the body. We realize that the wight could possibly reanimate if given enough time. Rowan comes forward with the jeweled sword, and drives into straight into his chest. The blade sinks through into the stone below. A quick tug confirms that the sword is stuck fast. The decision to burn the wight’s remains is unanimous. We get the tinder box from the poor terrified mule and set the torso alight. It arches in agony, and surely if it still had a mouth it would be screaming. The flames consume the bone-dry armor and desiccated flesh eagerly. We turn away from the defeated wight and venture deeper into the cave. Visibility is low--even those of the party with nightvision have a 50% reduction. We shuffle along single file. The passage narrows almost suffocatingly before it opens out into a huge cavern where the dragon corpse rests, as if it decided to lay down and sleep there. The corpse is absolutely massive. It’s tail ends in an enormous serrated spike, and a crown of impressive horns tops the skull. The entire skeleton is covered in thick dust. Any hoard it may have gathered has long been looted. Kezia passes a wisdom check and spots that the dragon is missing 3 horns. Clearly, someone else has been here, and it’s likely it was the Crooked King, back during his days of conquest for the cup. We realize that we have not confirmed that Wolfgang actually gave us the Cup. We take this opportunity to look inside the chest at the Cup before we go any further. Alistina and Evadne give the box and key to Kezia, who looks inside. The cup is no bigger than a shotglass and made of simple pewter. Seemingly innocuous. After some debate we take 3 more horns from it’s head, and an assortment of teeth, which we stow in Evadne’s knapsack. When we finally exit the cave, both the wight and the sword are gone. Only a great scorch mark remains. We edge around it, unwilling to touch it, and head back down the steps to the pass. While we were inside the cave, the weather has grown even worse than before. After walking North for hours along the pass, we come upon the scant remains of the great northern wall, destroyed now by neglect rather than warfare, judging from the moss and creeper vines. We scramble over the remains and spy a village in the distance. It is raining buckets of cold, miserable rain on us, and we hurry as fast as we are able towards the warm lights. We pass a huge dwarf statue and see various dwarves kissing it as they go by. It’s clearly a mining town, judging from the equipment and the state of the dwarves. Up ahead, barely visible through the sleet, is a tavern. We anxiously crowd inside after convincing our donkey into a barely-adequate lean-to just by the tavern. The building is made for dwarves--anyone in the party taller than a dwarf has to stoop (rather uncomfortably). We learn that the physical border with the Stone Coast is just an hour’s walk from this town. Kezia goes to chat up the bartender, asking about passage to the Stone Coast. We learn that the physical border with the Stone Coast is just an hour’s walk from this town from the chatter around us. Kezia goes to chat up the bartender, asking about passage to the Stone Coast. He laughs, says no one wants to go there. She does a little digging and comes up with the name of our destination where the Cup is supposed to rest: The Cloud Mountains. Kezia asks if there is anything we should know about the Stone Coast and the Cloud Mtns before we visit them. He laughs again, says his dad went to the Cloud Mtns some years ago and promptly went mad. Many go to Cloud Mountain looking for riches or fabled artefacts, but no one EVER returns from the Cloud Mtns...Except for one person, years ago. The Crooked King took his entire army into the Cloud Mtns, and only he emerged. The bartender looks at all of us for a moment, then tells us that recently, one other person has survived the unknowable horrors of the Cloud Mtns as well--a warrior in an antlered helm, riding a great wolf. And as if surviving wasn’t enough--he brought someone back with him. There were a few people in his tavern several weeks ago asking about the Cup and the Cloud Mtns. Kezia tries to contain her excitement, and asks if he remembers any other details. Were they from the Stone Coast? He shakes his head. He doesn’t know. Kezia presses on to the matter at hand, and says that we need passage to the Cloud Mtns, regardless of his opinions on the matter. He says there is a ferry, and a ferryman, and we will really not like either of them. We exchange glances at this, but say nothing. We thank him for his hospitality, restock supplies, and head back outside to grab the mule. We leave the pass and angle West, towards the waterway. The further we go down the dirt path, the foggier it gets. When we actually reach the coast, the fog is dense and claustrophobic, but also strangely warm. It’s comforting and terrifying. There is a jetty that stretches out into the dark, inky blackness of the ocean, and right next to us squats a ramshackle building that can hardly be called a hut. Outside by the door is a prominent bell with a string. Alistina rings the bell. Alistina tells him we want to take the ferry. He comes out of his hut, closes the door, eyeballs us critically, then turns away and says for us to follow him. We ask about payment, but he laughs us away, and beckons for us to follow. When we reach the end of the jetty, he says without a trace of humor that the toll for taking *this* particular ferry is our souls. When pressed, he says that he has been the ferryman for hundreds of years, and since no one ever survives the trip to AND from the Cloud Mtns, he takes their souls in payment, thus keeping him (relatively) young. Uneasy now, we ask when the ferry leaves, and he laughs again. “Oh, no, I’m not the one taking you to the Cloud Mtns. The only way there is on the ghost ship, captained by the ghost sailor Montague.” We digest this news. Evadne asks him if anyone has taken the ferry recently and returned. The ferryman says Montague does not DO return journeys. However, the only man to have walked away from the Mtns are the Crooked King, who took 42 men with him on the ferry and emerged from the Mtns on the other side alone. A few weeks ago, the warrior astride the giant wolf took 420 men onto Montague’s ferry, and returned alone. A viking longship materializes out of the gloom, gliding noiselessly through the black water. It is massive, with huge, billowy sails (even though there is no wind). Two long fan-like sails run along both sides of the ship, folded and lashed back. Hooded, hunched-over figures go about the deck, while a tall, hooded figure mans the tiller. Montague leaps from the ship onto the jetty and approaches the group of adventurers. Evadne steps forward and makes eye contact with the ghost sailor. Only his eyes move--the rest of his face is strangely immobile. “Where will you be dropping us off?” Evadne asks. Evadne glances around at the faces of her companions. All of them nod, though not without some trepidation. “Yes, we will take the ferry,” she says to Montague. He motions for the group to grab their things. We leap from the jetty onto the ship deck. The other sailors go about their business, ignoring us. Slowly the ship turns to port, angling back out into the fathomless black and pulling away from the jetty with surprising speed. We try unsuccessfully to get more information about what awaits us at Cloud Mtns, but Montague instead tells us to hang on. We heed him, gripping the railing and the mast. He pulls a lever near the tiller, and the folded fan-sails on either side swing out and open up like giant wings. The dead hands run about the deck, urgently hauling rope. Montague pulls the lever again, and we watch, awestruck, as the ship pulls up from the water, and begins to ascend upwards through the fog. The air quickly grows cold. Within minutes the ship has cleared the layer of fog, the landscape lost far below. The only thing above us are clouds, and below us, the murky wash of fog. The ship flies onward, bearing us to the Cloud Mtns. Now it's time for another Google+ Basic D&D game report, bought to you by Nancy Petru - wordsmith - and sponsored by some company with lots of cash doing something they obviously think is worthwhile and they really want you to buy it. I forget who. Ballamin and Ridley were discovered in their hiding places by the hobgoblins - Ballamin hightails it back to the party waiting for news on the road. Ridley, in a flash of inspiration and a rather large dash of luck, chucks her flask of oil over the bonfire and towards the cart, oil spraying everywhere. Some of it catches fire and gets carried over the cart, setting it ablaze. Ridley pelts back to the party. The hobgoblins close in for the attack! Alistina kills hers with a mace, while Ballamin fights a bit longer with his before stomping on the hobgoblin’s head and cracking it like a coconut. Ridley fights her hobgoblin with her dagger, and it’s a near thing before she kicks him away. He stumbled backwards, trips, and impales himself on a wicked-looking tree branch. Valira eventually stabbed her hobgoblin up through the chin, straight into the roof of his mouth, his shorn tongue falling out onto the ground. Evadne hacked a few times at her hobgoblin before hewing his arm away, and Kezia eventually slashes her hobgoblin to shreds. 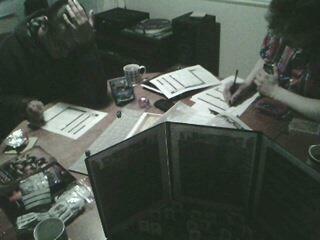 The party loots the bodies, trading up where possible. There is a gorgeous masterwork axe that Alistina decides to keep for the time being. The party gets to the clearing where the hobgoblins were sheltering. A horrible, hoarse voice is emanating from the crate, pleading for us to release it. If we release it, the voice promises, it will grant us a boon. We begin to argue fiercely about whether to open the crate and release whatever is inside. After some very strong opinions, we agree to open the crate, as we are running out of time as the flames further consume the wood. Ballamin opens the latch on the crate, and the entire thing explodes outward as a giant spider the size of an elephant comes tearing past, several of her half-grown spawn clinging to her burnt sides. She is clearly hurt. Kezia attempts to heal the giant spider matriarch, but she hisses, clearly distrustful of magic, and Kezia stops. She stops one of her kin from attacking us, and vomits an object onto the ground, which Ballamin picks up. It is a horn that will summon her brethren to our aid just once. She tells the party, glaring balefully at us through her cluster of eyes, that if she ever comes across any of us again, she will kill us straight away. She lurches away from the bonfire, her kin riding and scuttling in her wake. Then we are alone in the clearing. We turn to leave. As if a chill wind has suddenly blown across our graves, we all feel compelled to look up at the peaks of the mountains, and there, on a faraway (but not too faraway) hilltop stands a foreboding figure who seems to emanate malice from his very form. A cloaked figure atop a truly gigantic wolf, his helm topped by a large rack of antlers, a massive lance clenched in his mailed fist. He holds us in fear for only a moment before descending down the hilltop, out of sight. We hurry away from the clearing, wondering if this is the man (if man he is) the hobgoblins were waiting to deliver the spider matriarch to. We come to a palisade across the road, blocking the pass, and send Alistina and Kezia, our only dwarves, to parley. A dwarf up on the wall asks them gruffly what their business is, and when they aren’t immediately forthcoming, he is quite rude until another dwarf appears on the wall and castigates Borik, the rude dwarf. This new dwarf looks quite regal and ushers us into camp, after inquiring about our full party. Everyone who succeeds for a charisma role is given just a cursory glance, but all who fail are looked at suspiciously. (Which isn’t all that bad, as dwarves are a naturally suspicious race). We walk into a cleared space with tents, lean-tos, and some small caves with plush tents. Looks like a working encampment. The Boss dwarf tells us they are starting a huge project to block up the pass - the ONLY pass through the mountains. He says we can pass through - never let it be said that the Blue John dwarves aren’t hospitable! He offers us food and rest before we make our way through the pass, but warns us that the pass is no longer safe. Things that have not been seen for an age are appearing from the caves and depths of the mountains, and we travel the pass at our own risk. We thank him for his kindness, (Borik the rude dwarf snorts derisively), and bed down for a well-earned rest. THE NEXT DAY the party wakes up to a howling storm. It’s freezing and thundering down fat drops of rain. Kezia goes to talk to the Boss dwarf, but Borik is the only dwarf available to answer any of her questions. She asks if there are any caves along the pass through the mountains (remember we are looking for that dragon skeleton in one of them) - she succeeds a charisma roll - and Borik tells her that there’s a cave on the left about midway down the pass, high up on the cliff, and it’s absolutely massive, which is good, because it has an equally massive dragon skeleton inside. Not believing her luck, Kezia presses him and asks what else we might encounter while trying to get to that cave. Borik eyes her for a moment before flatly warning her that a body is laying in the middle of the road, right in front of the dwarf-hewn stairs that lead to the dragon cave, and anyone who has gone near the body has disappeared, never to be seen again. Kezia comes back with this information and shares it with the party. We all exchange grim looks but decide to carry on. What choice do we have? You can’t just nip down to the local trader and pick up some powdered dragon bone. We begin down the pass, and it is hard going. It is still raining, almost sleeting, and we hunch over miserably in our cloaks (given to us by the kind dwarves), and doggedly put one foot in front of the other and travel without speaking. Morale is somewhat low at this point. We see the body before we see the stairs and the cave. It is as Borik said - right in the middle of the road, face down. It is wearing a suit of armor that is long out of fashion, wrought during the days of old. A beautiful bejeweled sword is sticking out if it’s back at a angle, looking as keen and sharp as if it had just been forged that very day. Another round of fierce arguing ensues as we debate pulling the sword from the body. Borik had said the body was found weeks ago, and no one has touched it or moved it, and yet the sword remains pristine despite the harsh elements of the pass. Clearly, it is magical, and likely worth a fortune. Kezia posits that the sword is indeed magical, and is keeping the body dead. Removing the sword may reanimate the warrior. We all agree that the sword looks too good to be true - surely it’s a trap! The party edges around the body, deciding to deal with it once we’ve secured the dragon bones, and ascends the stairs to the cave mouth. It is darker than night in the interior of the cave. It is not merely dark, but the utter absence of light. Morale dips a bit further. We start to light a lantern, but a monstrous gust of wind issuing from the mouth of the cave blows it out. The wind travels out into the pass. One of us passes a wisdom check and points out to the others that the rain has ceased, but we can can still hear it, but now it’s far away. The silence is deafening. We turn around, almost knowing what we’ll find. At the bottom of the stairs the corpse has arisen, skin dessicated and stretched over the bones like a tightly-fitted drumhead. The jeweled sword is clenched in one skeletal hand, a baleful red light burning in its eye sockets. This series of blogs about the recent Google+ Basic D&D game I've been running was primarily written by Nancy Petru, one of the players of the game who kept some rather excellent notes about the game as we played it so that the players could be kept up to speed on the story, so full credit for these blog posts go to her and her fine attention to detail. Over the last few weeks I've been running a Basic D&D game for some of the members at the International Geek Girl Pen Pal Club, a smashing little organisation that allows ladynerds to contact each other all over the world via snail mail. It's a great idea and some fast friendships have been created. 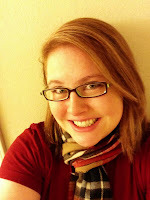 My wife Lisa joined a long time ago and she suggested to some members that they should try roleplaying and she asked me what game I would choose should I run a game over the video chat of Google+. Little did I know that she had volunteered me for the DMing duty, so I had to design and run a game for ladynerds, some of whom had some experienced with RPGs and some who had no experience whatsoever. Our band was summoned by King Ulfred (the Crooked King) of the prosperous kingdom of Kingshold in the Forgotten Realms for a private audience. Once inside the audience chamber, we saw the throne in the middle of the hall, illuminated by a shaft of light. It’s empty. A man (Wolfgang) exits the chamber by way of a small side door. He does not beckon us to follow. We dithered about, discussing the possibility of a trap. After all, no one has seen the Crooked King in years, and Kingshold, while historically wealthy, has started to look a bit worn, and has had several skirmishes with its enemies on the Stone Coast. There is no way of knowing if the King still lives, or if this summons is just a trap. Two giant metal axes attached to sturdy chains hang crossed over the doorway. It seems that if they are triggered, whomever is unlucky enough to be underneath will be sliced to mush. Kezia cast Detect Evil, and found nothing. Alistina cast Shield on Evadne, who walked underneath the axes into the hallway. Nothing happened. Thankfully. We approach the gigantic four poster bed where King Ulfred reclines, surrounded by healers and attendants. The Crooked King - it’s an apt title indeed, because he looks like the Elephant Man, covered in grotesque boils that ooze pus. The burly man we saw earlier, Wolfgang, is near the King. It’s hard for the King to see us through his twisted eyelids, let alone talk, but he reveals his quest for us; We are to take a magical artifact, the Cup, and return it to it’s rightful resting place deep in the Stone Coast. As Kingshold and the Stone Coast are bitter enemies, we - a band of travelers that cross borders - are the perfect group for this task. Evadne succeeded with a Charisma roll and asked if the Cup and the King’s affliction were related - the King would only say that that they were indeed related. When asked what would happen if the quest failed, the King told us that the entirety of Kingshold would wither away. (In other words - no pressure). The King promises to reward us with wealth from Kingshold’s renewed coffers if we complete this quest. We accept. He tells us that first, before we take the cup to the Stone Coast, we will actually need to fill it up with dust from a dragon’s bones. He says that he knows of a dead dragon in the Blue Mountains, and that if we were to go there first, we’d have the hard part of the quest (arguably) out of the way. Tracking down a live dragon and slaying it would be monumentally difficult. We are given provisions, and Wolfgang gives us a box containing the Cup and a tiny key on a silver chain that fits the box’s padlock. After a quick decision, we are off for the Blue Mountains. James Semple is an incredibly talented composer friend of mine - I've interviewed him a couple of times on this blog - and he's done some great soundtrack work. His roleplaying experience is pretty darned wide and varied and he's done music for Pelgrane Press for some of their games - the 'Esoterrorists', 'Trail of Cthulhu' and 'Ashen Stars'. Now he's part of the team that have composed music for 'Eternal Lies', a campaign for Trail of Cthulhu, the tabletop RPG written by Will Hindmarch, Jeff Tidball and Jeremy Keller. The trailer video below is by Jame's partner in crime Mike Torr and James Semple, featuring the voice of Wil Wheaton - yes, the actual Wil Wheaton - with music from the soundtrack album The Complete Eternal Lies Suite. I've not read or played Trail of Cthulhu, but after watching this trailer it makes me want to get hold of the core rulebook and the campaign itself, due out in August. Mainly, though, I just want to say well done to James on being the face of Wil Wheaton's voice!